I'm so sorry you've had a rough week. My thoughts and prayers go out to your grandma and your whole family. These little gratitude stones are adorable and the reason for them is commendable. We all sometimes need reminders to be thankful. Positive energy to you and big hugs on top of that! Thanks Teeni! We're getting through it and hoping for the best. At least I've got crochet (and my friends!) to keep me distracted! Big hugs back atcha! Hi Sylvye! Thank you so much! I agree with you completely, I know that I'm going to be so glad that I was the one that had this amazing opportunity to spend this time with her, even though it's hard to watch her slowly declining. Today, though, I am very grateful for incredibly thoughtful friends like you! Oh, lady, there aren't words...... you are awesome. Three cheers for finding a way to overcome the worry-gene. SO glad Mema is getting better. Yes, thank you... Do you know how much I love you?! THIIIIIIIIIIS much! This week has been such a challenge, I am pretty sure (now that I think about it) I have not had a chance to take a shower. Ugh. TMI, I know. Sending you all hugs and love in the hopes that things get back to normal real soon! I am grateful to you for keeping your sense of humor and making the rest of us smile even through your difficult times. I'm so sorry Jaime. I am going to pray for your family, especially your Grams. I will also send Reiki. I love the stones you made, it's a very excellent idea, much like a reminder for affirmations. God is with you always remember that too, he will never leave you nor forsake you, and he is a friend that sticketh closer than a brother. I will plead to him and ask for healing in your situation. I know he will listen. Hugs Jaime, keep your hope alive, you are doing good. Know that I care too. 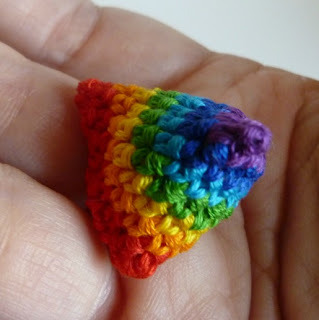 I have been watching some crochet videos (This being one: http://www.youtube.com/watch?v=vax4DaI968M&feature=share&list=PL166DA68A2E700BDB) and the hook she is using brought this post of yours to mind. I recalled you mentioning that you like different brands for different "yarn" and that got me wondering if trying a different brand than the ones I have might make a particular yarn I have a stash of easier to work with. Seems like that could help. Hi Syl! YESS!!!! Try a different brand of hook if you've got a yarn that's giving you trouble!! Sometimes the head of the hook makes yarns split, or doesn't penetrate through the loops easily enough, or the throat isn't large enough to pull the loop through without tugging, which isn't the yarn (or your) fault! Blame the hook and try a new one!!! Thank you so much for all of the wonderfully sweet things you said. It means more to me than you could possibly know. Hi Jamie. 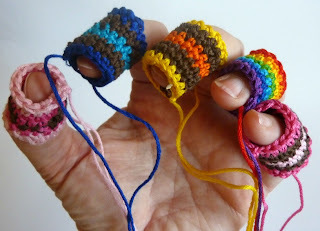 I found your blog through the Hooked on Crochet news letter. I am so glad I did and will start following you. I really like your Gratitude Stones. I was my mothers caregiver for 2 years. It is a struggle at times and I could have used these earlier. She passed away this past Dec. 13 and I know she is not suffering and with my father now. I will be making the 'stones' to carry with me to help the sadness I feel from losing her. Prayers and thoughts to you, your grandmother and family. Hope your grandmother improves. Thank you for sharing! Everyone can use a hug... Hugs to you! Hi Patricia. I am so sorry for your loss. Great big giant hugs to you!!! I'm glad your mom isn't suffering anymore, but I am so sad for you. You are in my prayers. I like the idea of using the stones as a memory stone. Gosh, I feel like everything I say isn't enough. I am so deeply sorry for your loss. God bless you for caring for your Nana. As we get older and realize we are unable to care of ourselves as we once did can bring depression to us too. The stones are something I will make, carry with myself, give to my family members and friends. We all need each other. My crocheting keeps me young as I make chemo hats for the chemo patients, lapgans for the wounded warriors, and hats for the homeless. We are blessed by our giving. Love and prayers to you and your Nanna. Hi there! Thank you so much! As a cancer survivor, I am so exited that you do so much charity crochet for cancer patients. It sucked losing my hair, but it was awesome that people cared enough to make us hats! You're doing amazing things!!! 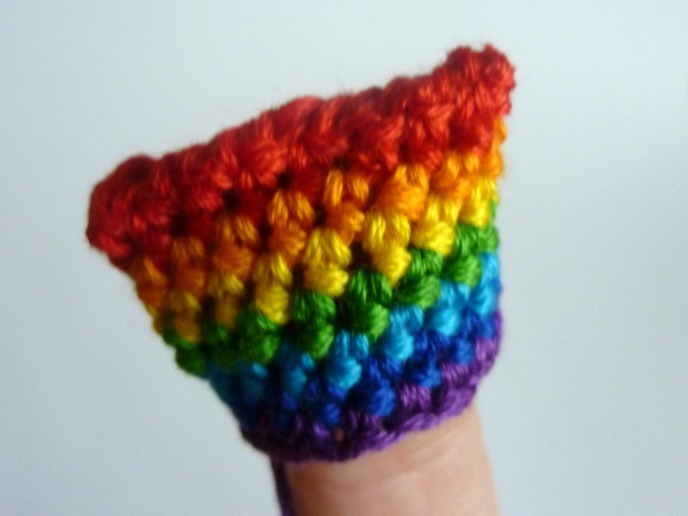 Just found your 'stones' pattern. Love the idea. Thanks. Bless your heart for taking such good care of your Granny. They are very precious people. So many never have the chance to relate to them. I am one of the lucky ones to have had mine for so many years way back. I still miss her and my Mom. 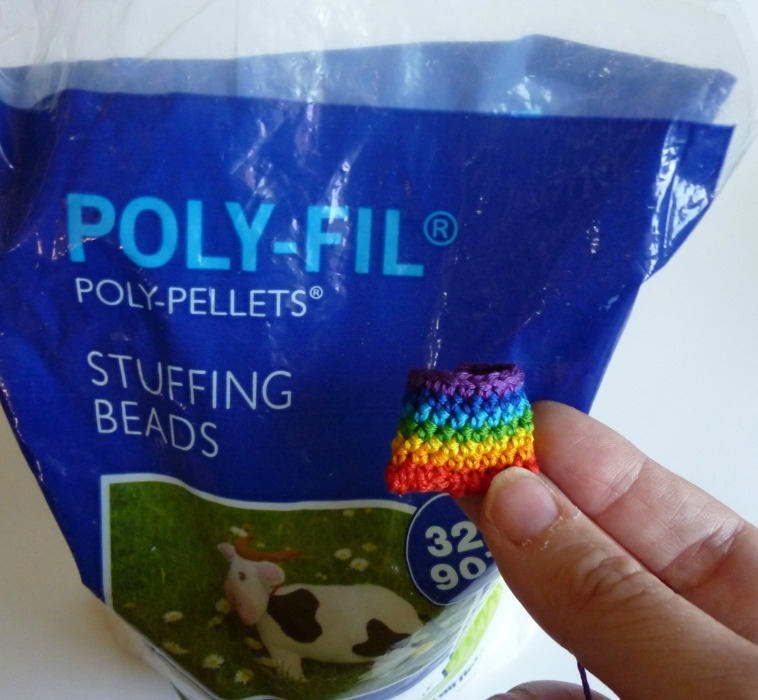 I am going to purchase a bag of the stuffing for the stones and get busy. God bless. Hi Aunt Dee! It really is a blessing, isn't it? I think my cousins are missing out! I'm so glad you found me! I hope to see you around more! I used a 'peaches and cream' yarn and made it into a cat toy. Polyfill, instead of polybeads, and a little catnip... She's still tossing it around. Ha! I love it!! I should make some of those for my mom's cat! I love your sense of humour in your writing. Just found your blog via the crochet crowd (not really sure how lol) Love these gratitude stones. I'm going to make some for my kids who are really ungrateful about everything and I hope to help then learn a more positive and gratfuly outlook. Thanks for the tute and the giggle. Hi Deanne! I think that "Tutes and Giggles" should be my new tagline for the blog! ♥ I'm so glad you found me, no matter how it came to be! I love new friends!!! I hope your experiment works, I think a positive and gratefuly outlook is one of the coolest gifts we can give our kids! I stumbled upon your site tonight. I love the gratitude stones idea. You are an inspiration. I am going to make some for friends who are going through rough patches. Love, love your site and will be a regular visitor. Hi Bowman Rita! I'm so glad you found me! Thank you so much. I hope that it helps your friends. And I hope to see you around lots!! This is a great idea. I'm such a worrier. I've had a life of trouble and strife no not a wife. I'm the wife but yes I've had trouble with me. Everytime I think things are looking up something happens to shatter any peace I've acquired. You can be happy even with bad health. Well most of the time the rest I think I'll make a gratitude stone and think of the good in my life rather than the trouble or be more optimistic about it. So thank you for this. I'd like to give your site to a great group of crafters who may all like help finding the good in everything. As a friend says `every cloud has a silver lining'. Not original to her but she uses that as a mantra. Hi there! What a beautiful mantra! I think that the one thing I've learned from this site is how many of us need a little dose of optimism in our lives every now and then. Thank you so much for your kind words, and please feel free to share anything you find on this site with whomever you want. 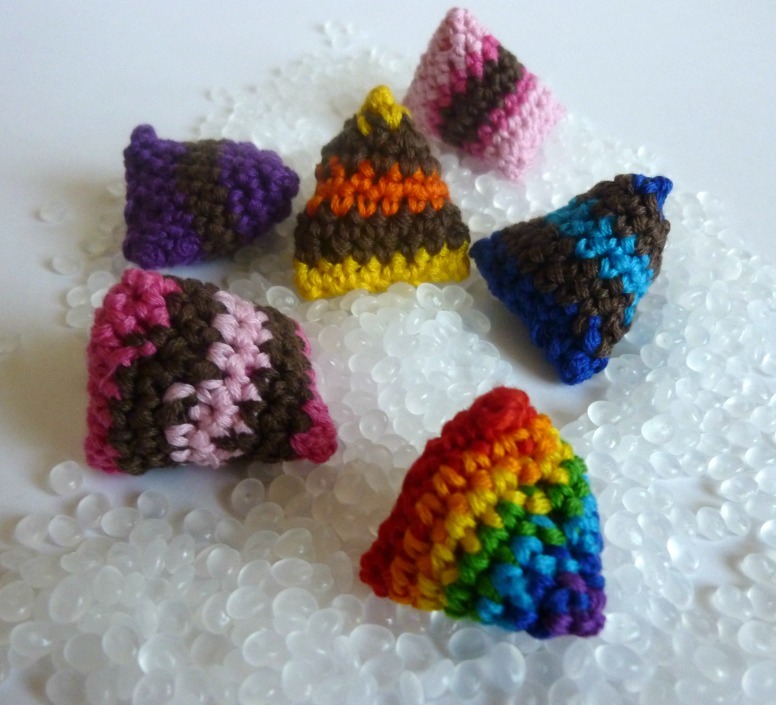 Just found your site through Hooked on Crochet and the Worry Stones. What a great idea! I have a stash of embroidery cotton but will have to get some poly fill. Thanks for the idea. I am the leader of a depression support group (taking a break over the holidays) but will be making some to take with me to give to participants. Wonderful to hear about your family--I was not able to take care of my mother and dad during their last days but visited every weekend (about a 200 mile round trip) and really feel blessed that I could share that much of the time they had left. They died knowing that they were loved, cherished and respected and I know that it made things easier for them and left me with a great legacy of memories. Just found the gratitude stones through the Hooked on Crochet newsletter, I'm going to make a bunch of em for my group of "downers", namely my teenagers and their friends who never seem to leave my barn. You'd think having horses and goats would solve most depression issues. Just watch them sometime, it's hilarious, but then "life" intrudes and takes that laughter away. These should give us some good reasons to remember and smile for no reason (as the saying goes-smile, it makes people wonder what you're up to) during the course of a day. Thank you for the great idea. I normally carry an obsidian stone around, it's my worry rock, but I could never find one my kids would keep track of. They aren't the right shape, or pretty enough, or whatever reason. These should fix that, by being whatever color they pick out. Thank you, and I hope your Grandmother is still hale and hearty, and enjoying your sassy company! Here's to the new year, may it be filled with love and laughter. I love your thoughts and pattern. I have odds and ends of number 10 cotton thread. It works up a little thinner than the floss. Now I only have to find the poly pellets. Thank you for designing the pattern. I enjoyed your post and am looking forward to making some for the "worry warts" in my life! Thanks for sharing and I hope things are going well in your life! Some folks crochet tighter or looser than others. 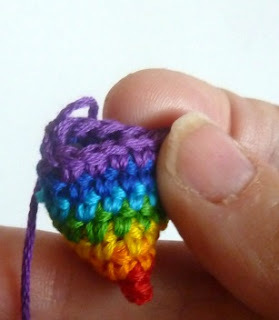 Try going down a hook size or two, and using a yarn under technique. Your stitches will tighten up and the pellets should stay in fine. Hope this helps. Thank you much for sharing. I can see this as a great tool to encourage people I come in contact with. I love these brightly colored rainbow-in-your-pocket, comforting little things. I inherited my grandmother's craft supplies, which included lots of embroidery floss. I now have a use for it. I'm passing them out to everyone I know. A positively inspiring idea. these beautiful rocks !!!! That would make the little gift complete !!!! What a wonderful idea. I can't wait to make these ! These are cute, they would make good cat toys with some nip in them. I hope your Grandma continues to improve. Hi there! Found your Gratitude Stones pattern very recently and love the idea behind them. I sat down to make one tonight as a trial run. Pattern and instructions are super easy to follow. I made one using exactly the supplies and hook described in the instructions and found that the poly pels came out of the stone after it was well sewn up. Did I overfill it? Underfill it? Not crochet my stitches tight enough? Suggestions would be appreciated....thank you! It likely wasn't the amount of filling that was the problem, unless the stone was packed as tight as possible. 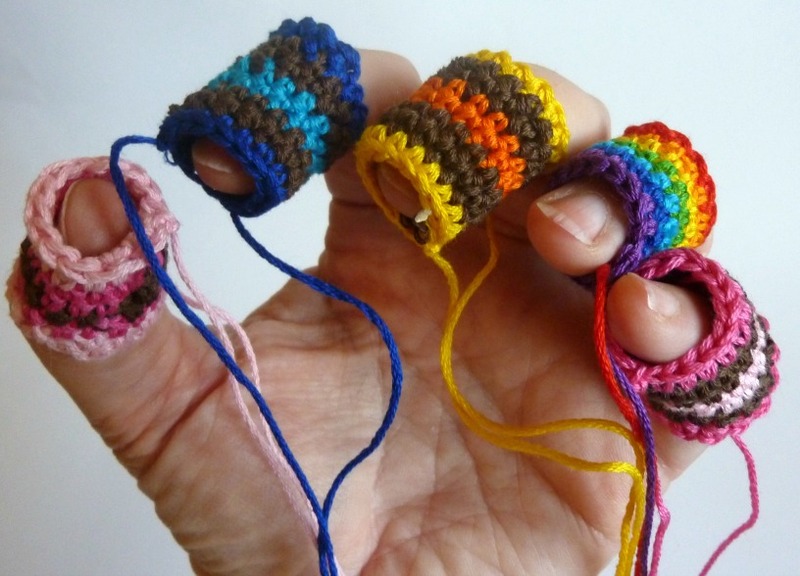 Some folks crochet tighter or looser than others. Try going down a hook size or two, and using a yarn under technique. 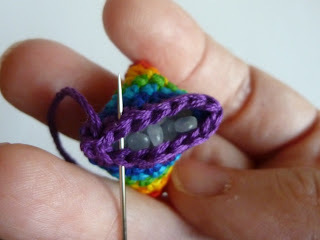 Your stitches will tighten up and the pellets should stay in fine. Hope this helps. My children have ASD and this will give them something else to fidget with and wish on. I'm going to have to go bigger so maybe they don't eat them. Neat idea, thanks for sharing.